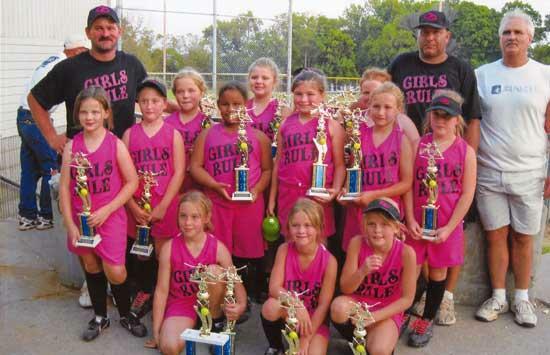 The spring 2010 softball season brought a new division to the Cannon County Dixie Youth Association with 7-8 year-old girls softball. For a new division, CCDYA was pleased that 41 girls played in the spring with 13 girls being selected to play for the Cannon County All-Star team. Even though the All-Stars may be over for the other CCDYA teams, the Girls Rule seasons continues until September. The team competed in the United Southern Girls Fastball (USGF), The Full Count Classic Tournament at Cane Ridge and they were second in their division. They will compete in the Fall Extravaganza in Murfreesboro and the Change-Up Challenge in Tullahoma. By sanctioning with the USGF the team will earn points per game/tournament to qualify for state tournaments. The Cannon County Girls Rule team consisted of, Abbie Judkins, Anna Brandon, Austin Grant, Caroline Blanton, Etta Gaines, Janie Yurgealitis, Jessica Kauffman, Julianna Schau, Kallie Kemp, Katie Hancock, Kristen Fann, Madison Blanton and Tori Duncan. The coaches were Jeremy Judkins, Chris Kauffman, Jeff Fann and Cynthia Judkins.